My contribution to the Embroiderers Guild 100 Hearts Project, commemorating the end of the First World War. Dedicated to the memory of the men of the merchant fleet, and in particular the many immigrants and naturalised citizens who, sometimes in the face of xenophobic hostility, continued to serve their adopted country faithfully and well, and brought up their children to think of it as home. 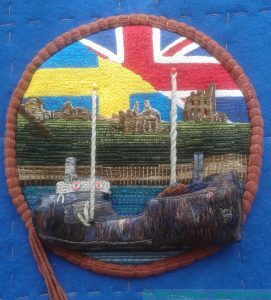 But in especial memory of my great grandfather Henry Frederick Bloom, who was Swedish, naturalised shortly after my Grandmama’s birth, and himself served throughout the War in the merchant fleet. 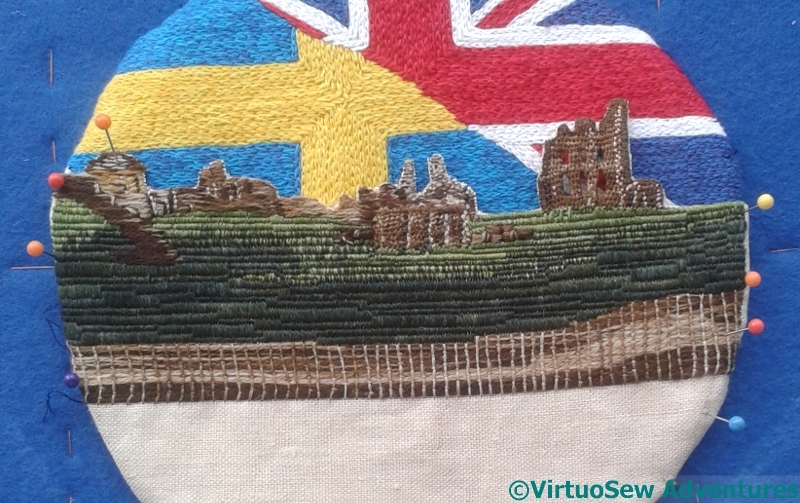 It has been allocated to the Liverpool exhibition, at Liverpool Cathedral, from September 7 until October 10. The assembly involved a lot of stages. 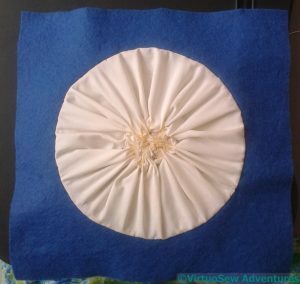 I cut the backing fabric into a circle and gathered it up behind the design to provide an extra layer of protection against the hurly-burly of the stuffing. At this point, though, I thought, I simply cannot fail to have my Morse Code signature on the back too. Morse Code was a staple of communications until well after the Second World War, so it was very much in use during the First World War..
Having attached my title and signature labels to the back piece, I printed a photo of the finished roundel, the title and the dedication onto a piece of fine cotton, within a circle, to echo the circular shape of the roundel on the front. Then I attached the cotton circle to the inside of the back piece. 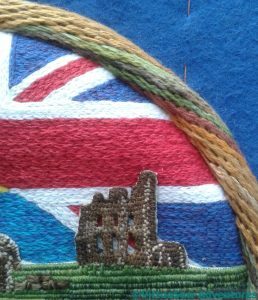 When the piece is finished, a circle of backstitches on the back will be all that shows that this is there, but I will know. I made assurance doubly sure of the assembly by first using running stitch to assemble the two sides of the Heart, and to close it after stuffing it. 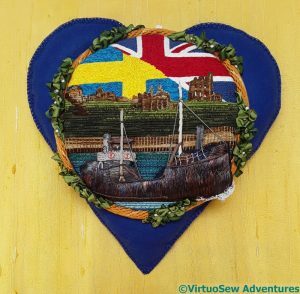 Then once the Heart was stuffed and closed, I reinforced the edge by stitching around it using Antwerp Edging Stitch, which is a knotted variation of blanket stitch. 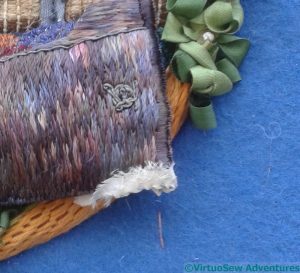 Final Details – I hope! 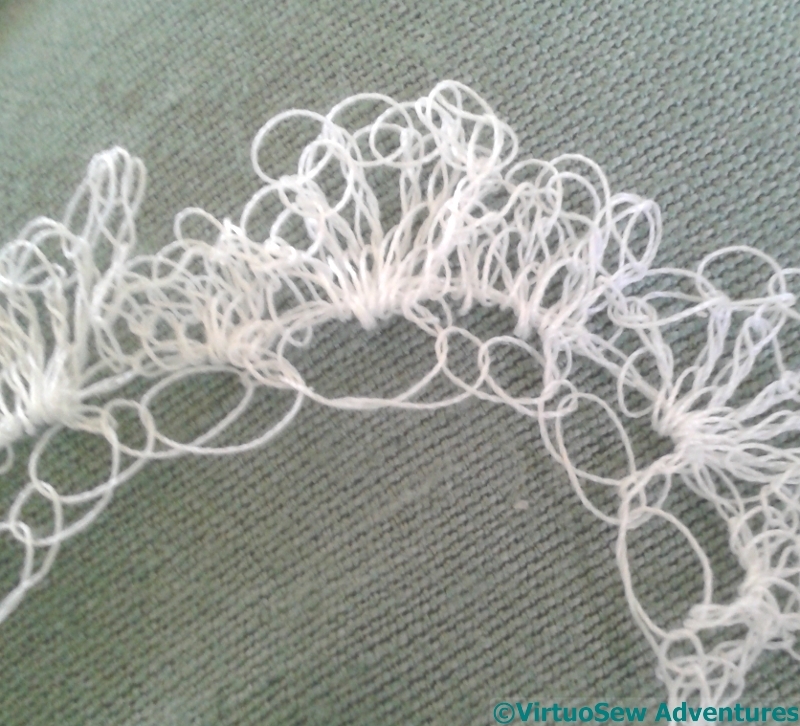 My first attempt to tackle the bow wave was to shred some white silk ribbon and try to attach it to the bow. That seemed a bit too white and a bit too solid. What it did do, however, was give me an inkling as to how tricky the attachment of the bow wave was going to be. “Fiddly” doesn’t come close! 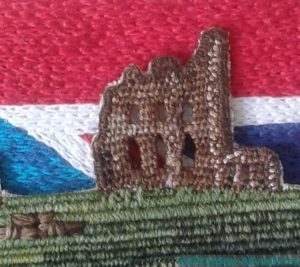 And remember, there are a lot of delicate little details already assembled, so I couldn’t be too heavy handed with the attachment, either. 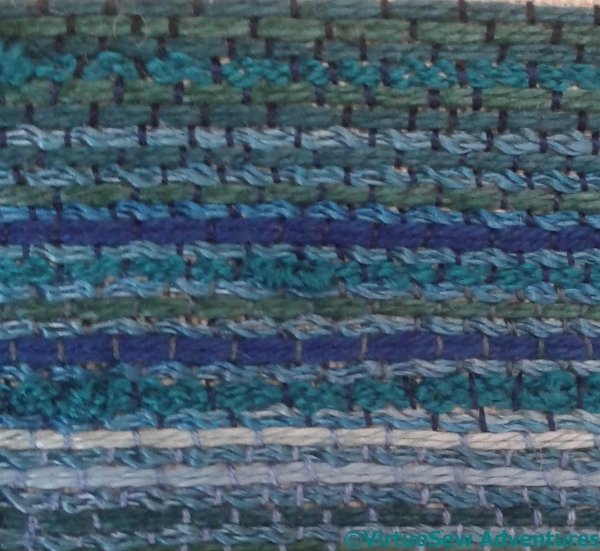 Having decided something lighter was needed, I tried another experiment: freeform crochet. 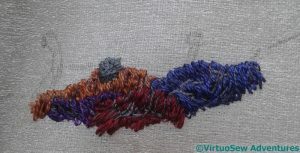 In this case I started by using one strand of a stranded silk, decided that even that was too heavy, and moved on to sewing cotton. I’ve done a sort of shell pattern, but varied the sizes of the shells slightly to give a bit more unevenness to the whole thing. I’ve also crocheted fairly loosely to give the right frothy effect of seafoam. The last few tweaks here are: the addition of the bow wave, and then the addition of railings around the deck cargo on the bow, and finally the rigging. 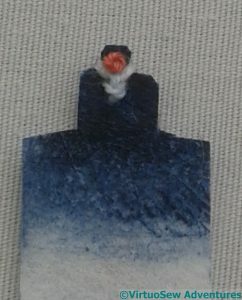 The railings are made using a paper covered wire painted silver and dirtied with inktense for the posts, and two lines of black and silver twist for the chains. They’ve been surprisingly effective in helping everything to sit at its right plane in the sequence from foreground to background. Now all I have to do (all!!!) is assemble my Heart! 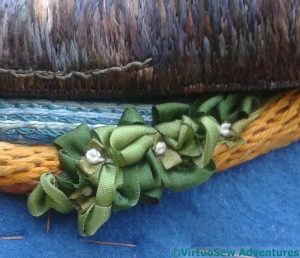 In the end I covered the twisted cord (actually a bamboo and cotton blend knitting yarn) for the mast and spars with silk ribbon, which was more than slightly fiddly to achieve. 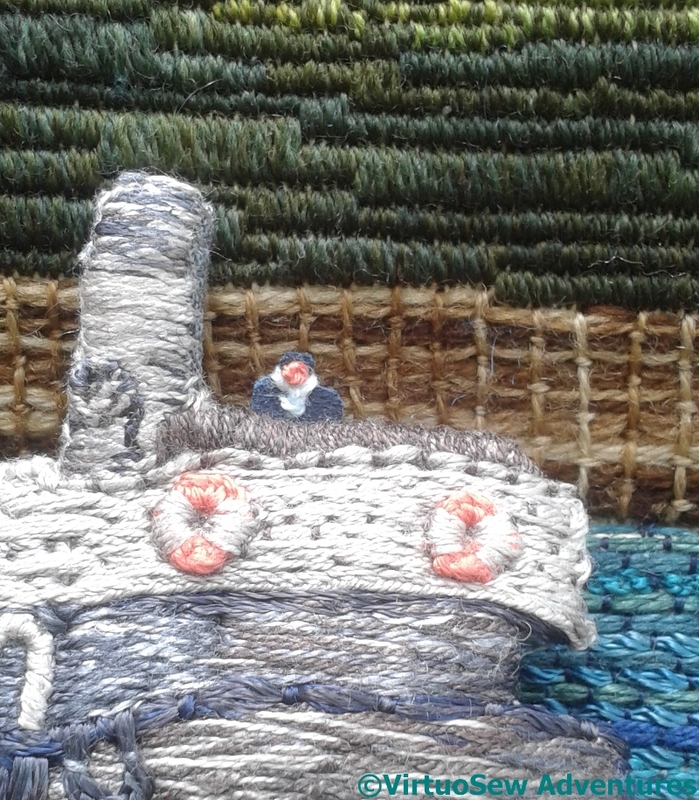 There’s a collar around the mast, which, in an echo of the lifebelts, is a loop of buttonhole stitch. That was even fiddlier (is that a word? It is now!). And Great-Grandfather’s wheelhouse has acquired a roof, made of several layers of buckram covered in silk ribbon, with buttonhole bars for the struts holding it up. 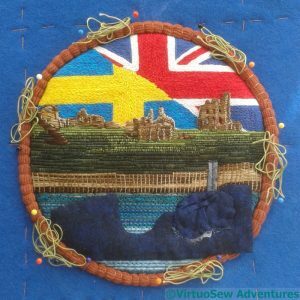 That was also fiddly! So, on to the wreath itself. That involved three different colours of silk ribbon, in two different width. I briefly considered something like the folded “leaf” shapes using wrapped parchement you sometimes see in 17th Century work, but in the end I decided I didn’t want to create anything too formal here, because it wouldn’t match the flow of the stitching. Sometimes a formal section provides a framework for everything else to clamber over, but here I felt it would create stopping-points, interrupting the eye as it moves around the piece. So the ribbons were knotted and looped and caught down in a sort of flowing chaos. White stranded silk French Knots, representing white berries, provide subtle accent and punctuation. As you see, the wreath is now in place, with just a few white berries – white for peace. I have quite a few more little tweaks to make, details to emphasize, maybe a bow-wave to add, but this is the original sketch brought mostly to life, and provides me with some hope that all that thinking and working will have a good result. While I was working on the string padding and testing the placement of the vessel section, I was able to test the placement and height of the masts. These are too high, but they are in roughly the right place, which is a step in the right direction, at least! Leaving that point to ponder, I finished the string padding and removed the vessel section, leaving its shadow in place. You may note that I’ve added a funnel, and a bit of extra padding for the deck cargo! Finally, I had another hard look at the photo and realised there was a watchkeeper on deck. 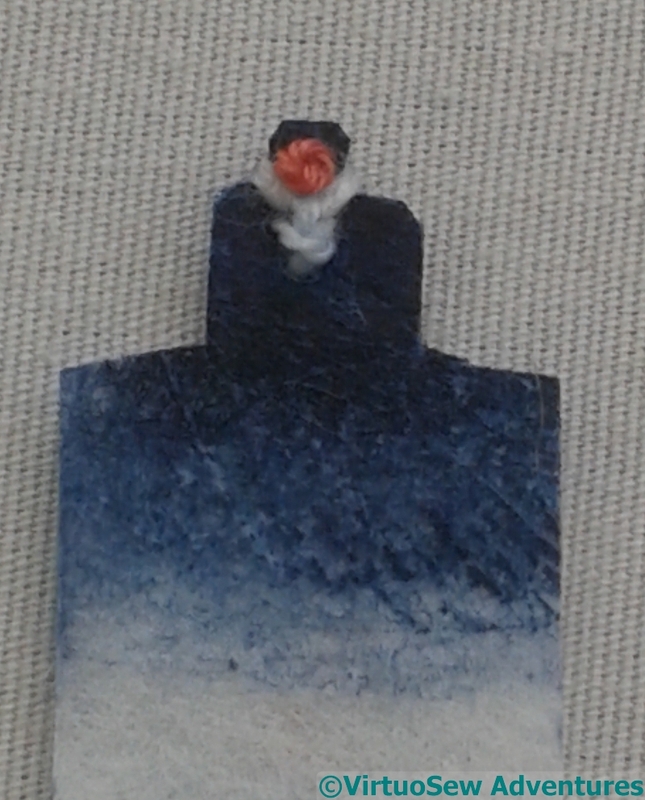 So here he is: buckram painted with inktense, a French knot for a face, and a knot of white thread for his scarf. 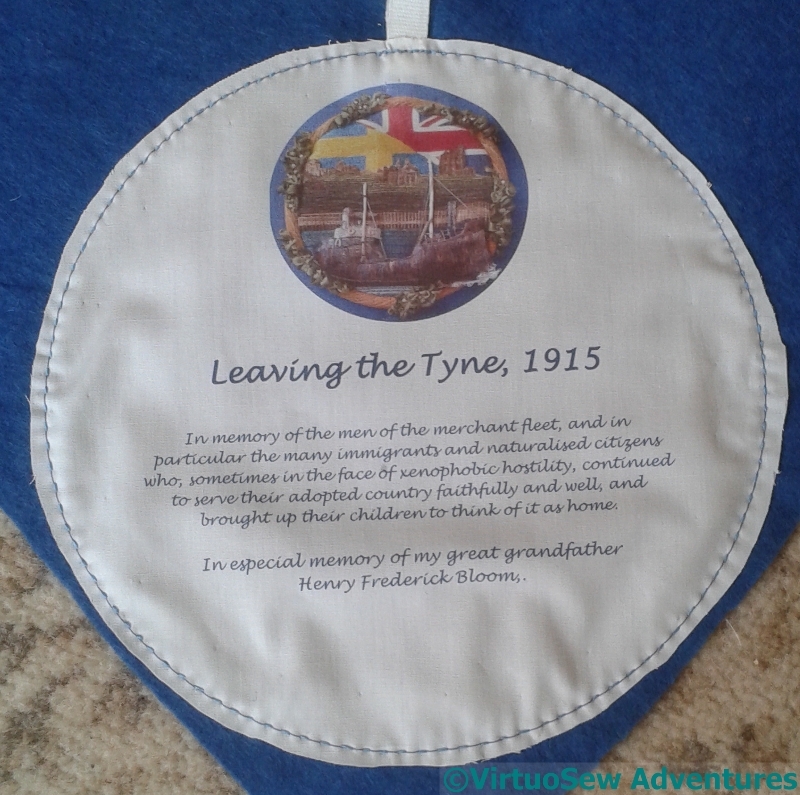 I’m going to say that this is Great-Grandfather, on watch as his ship leaves the Tyne. Once the sea was done, of course, it had to be attached. 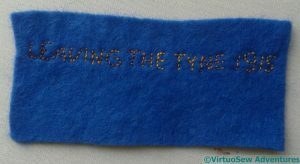 Again, a gathering thread, and tucking it around the edge of the buckram-and-padding base. That wasn’t too much of a trial,as it turned out, and once it was done, I could sit back and look at it. I’m really quite pleased. There is a lot to come, but I think this makes a very strong start. 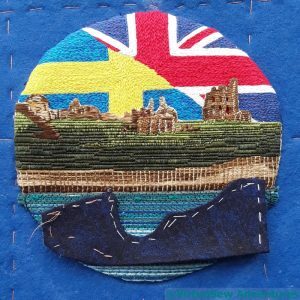 In particular, the headland and the priory stand up well to the flags which could so easily dominate, and the sea supports both. Good! 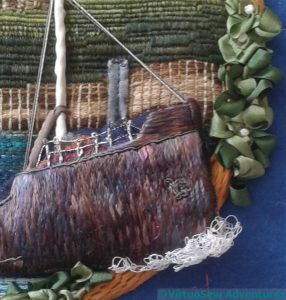 Not that much of the sea is going to be on show, but I’d rather do the whole breadth and not have to worry about exact placement. It’s also quicker to do the whole breadth than it is to do short intermittent sections! 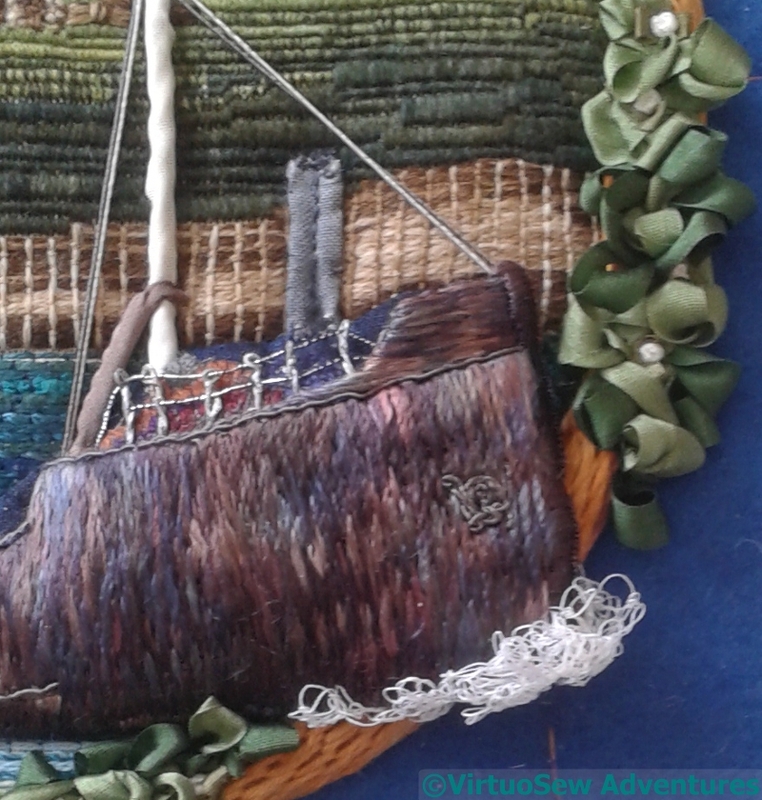 I want the vessel to be strongly raised, sailing out at the viewer, so before I attach the ship, I attached an underlayer, using wadding covered with printed cotton. It’s just tacked in place here, but you can see that I’ve set it to run out over the frame, when that is in place. The preparation for the frame is underway in this picture. I’ve used several layers of string padding, and overlaid the ship piece to give a bit more of a hint of how it is going to look. 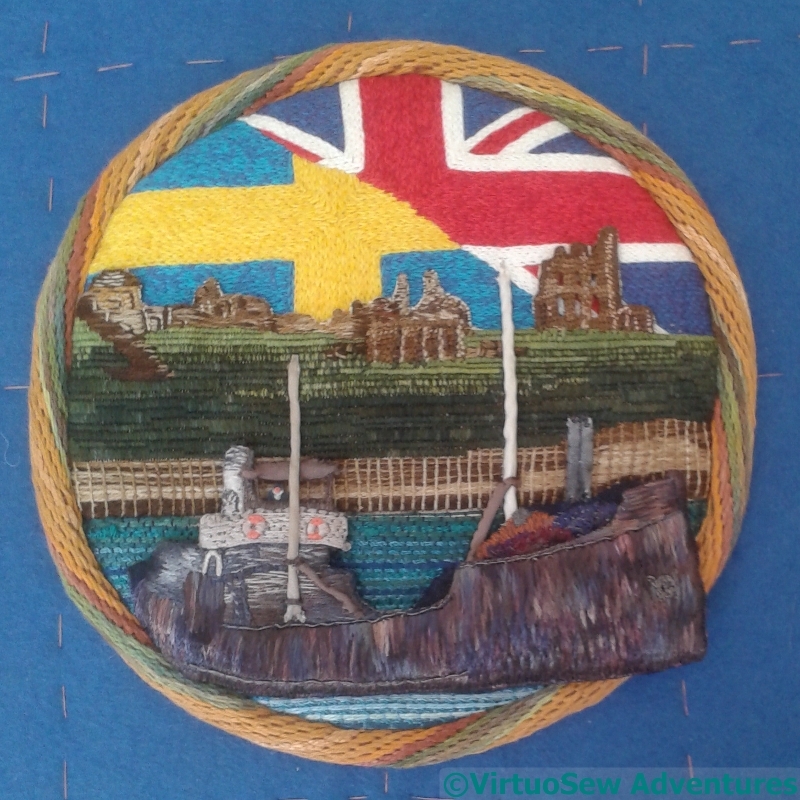 Once I had the roundel started, I was able to finish the vessel – which, like the flags, I’d not done quite enough of ! 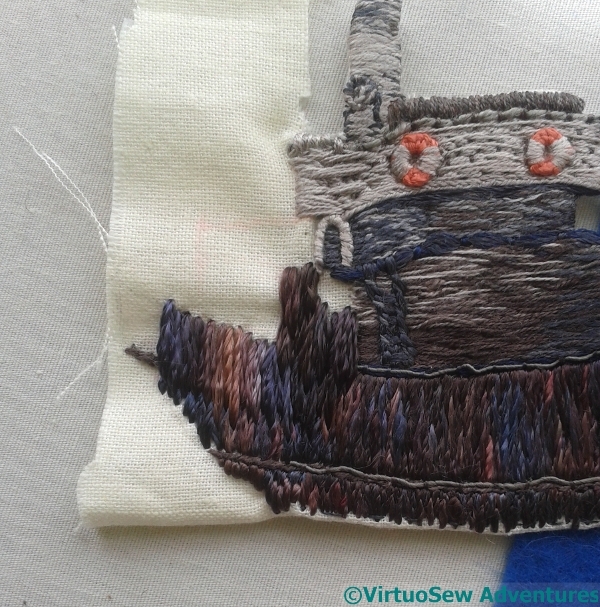 By finish, I mean stitch the last bit of the stern that I need, and then cut out, and turn in the edges. 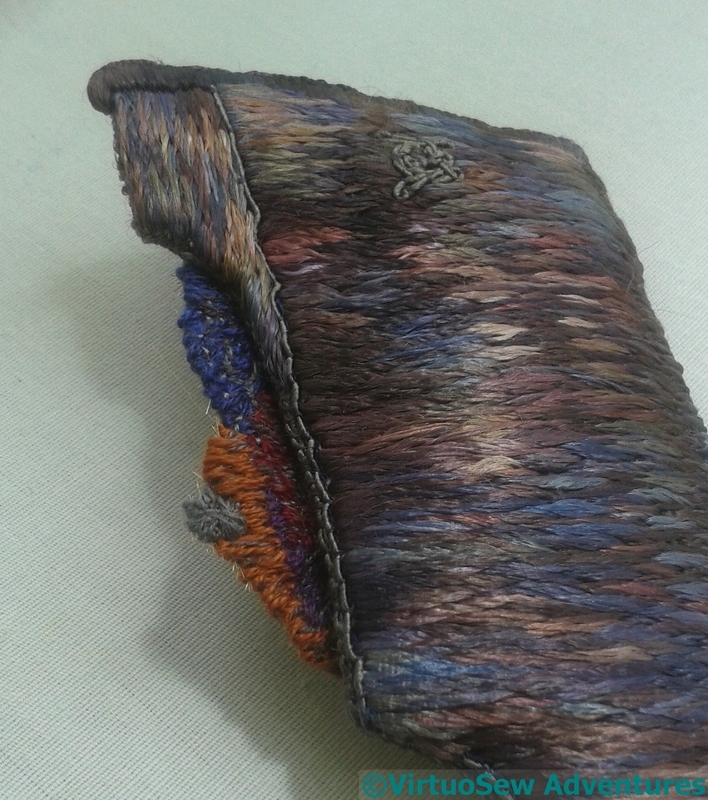 Then go around the edges again, covering them with gimp or stitchery in suitable colours to hide the calico. I also stitched an odd little fragment over a piece of gauze. This is going to help represent the deck cargo in the bows. 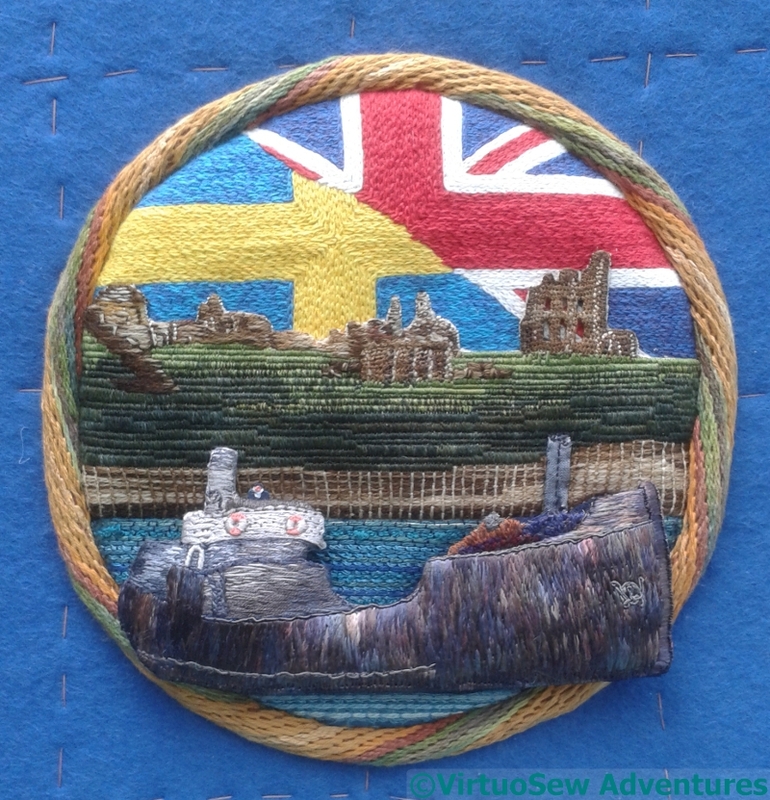 The colours are quite dark, and stitched-in creases in grey helps to make it a bit more weatherbeaten. Then there was still more padding to add, and the deck cargo to put in place. 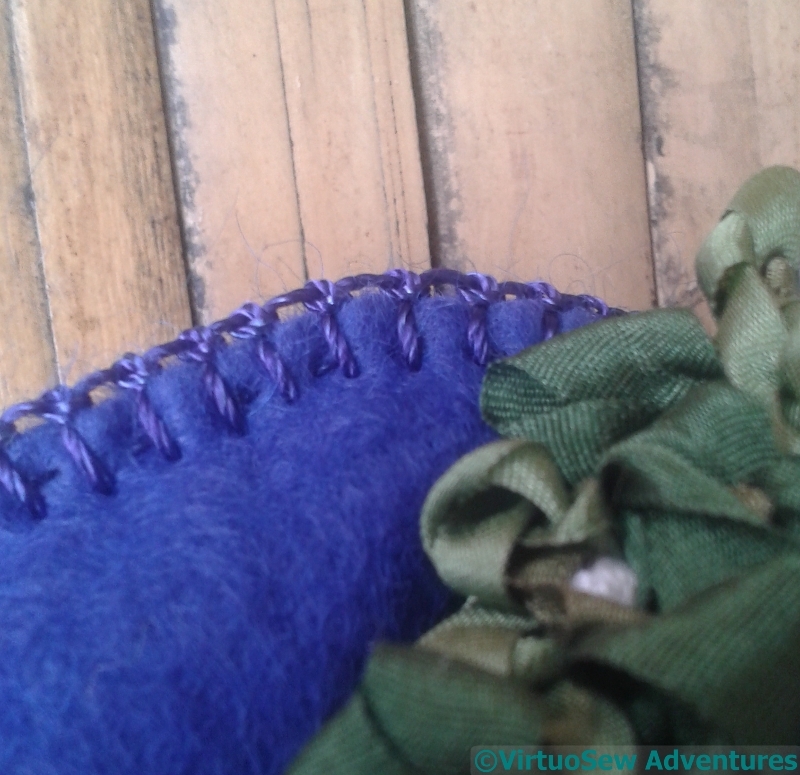 This angle on the bows allows you to see the extra gimp running down the edge, and how much extra padding I’ve put in. 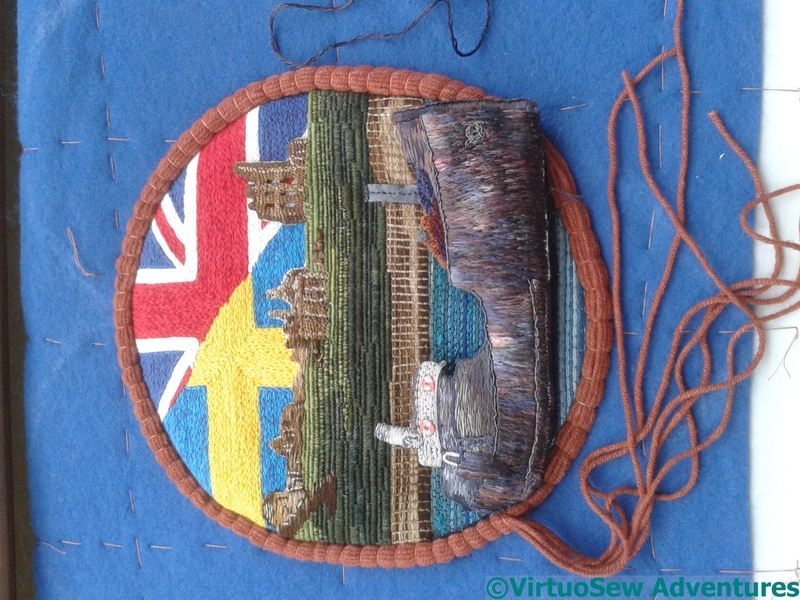 You can also see the deck cargo – I cut close to the top edge, and then used the fabric below to attach it to the back of the vessel. 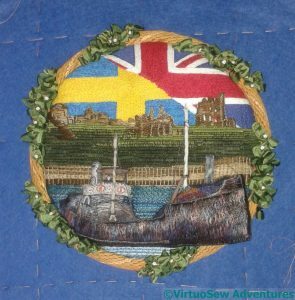 Having got the headland attached, I moved on to the sea. 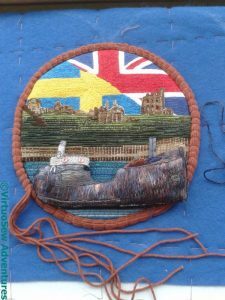 I began by colouring a piece of fabric with Inktense and aloe vera gel, and then started to work whipped running stitch across the width for the sea. The idea of the colour was to keep the fabric from showing through. Don’t like it. Not one bit. 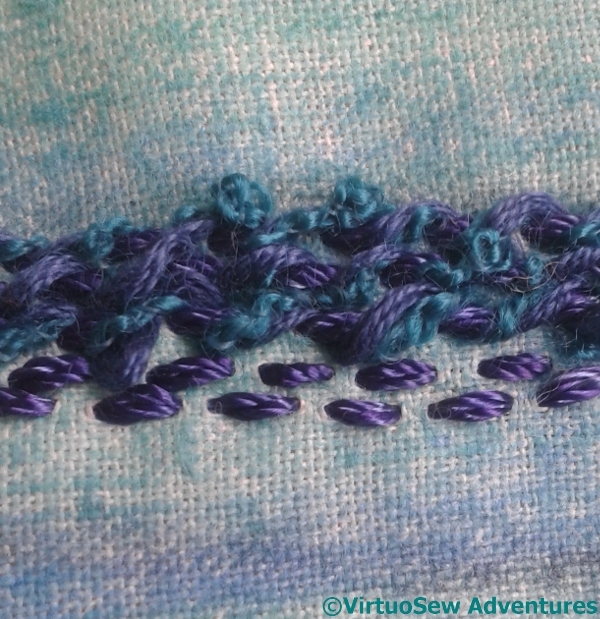 The fabric was too tightly woven for the threads I want to use, and it wasn’t growing quickly enough. Fortunately that was the only false start. The second version was rows and rows of couching. I used a less finely woven fabric, although that mattered less in any case when I settled on couching. 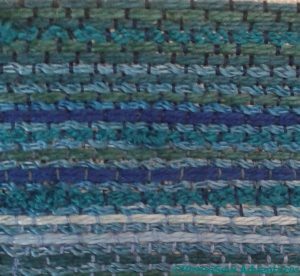 This gave me the change to make good use of some textured yarns to create the impression of a slightly sullen, lumpy sea. 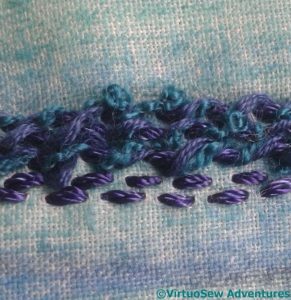 After the first few lines, I used an overdyed rayon spiral yarn as the “standard sea colour”, and alternated it with variety of other threads, couching them down with different tones of thread and lightening as they came forward towards the front. The tones of the couching threads help to modify the colours of the couched threads. 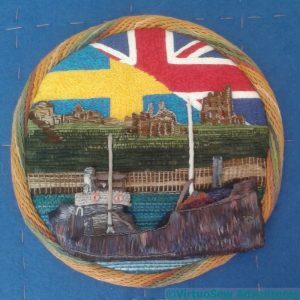 Once I had extended the flag sunrise -by nearly half an inch in all directions, just in case – I ironed it, and then ran a gathering thread around the curve. 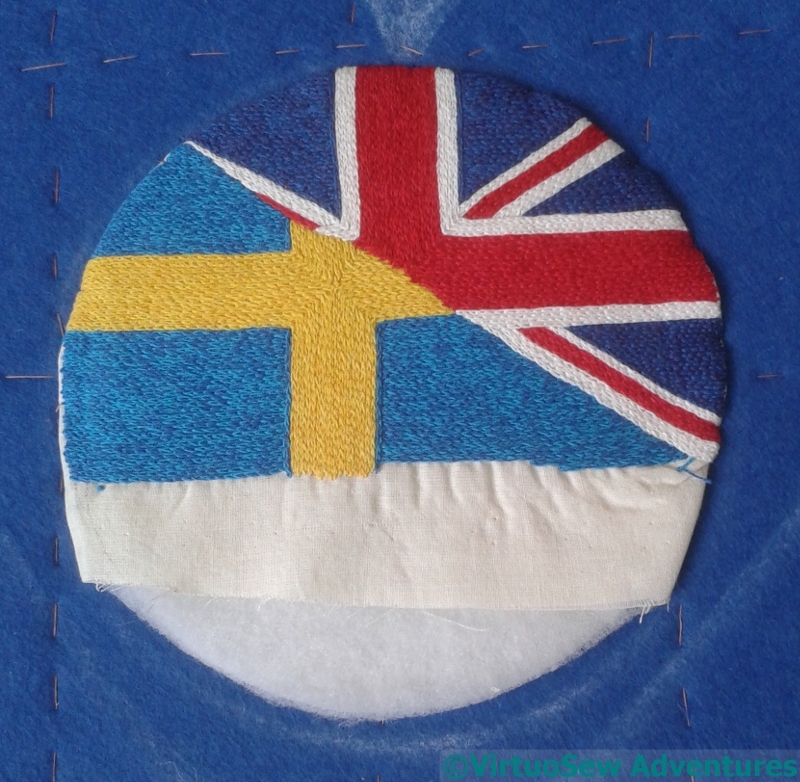 I’ve cut a circle of heavy buckram and another of wadding, and stretched the flag sunrise over the top. Before I tried to attach it, I flattened it very thoroughly, and trimmed away as much of the excess fabric as I could. Then I fitted it into the circle I’d drawn on the backing fabric already, and stitched it down. 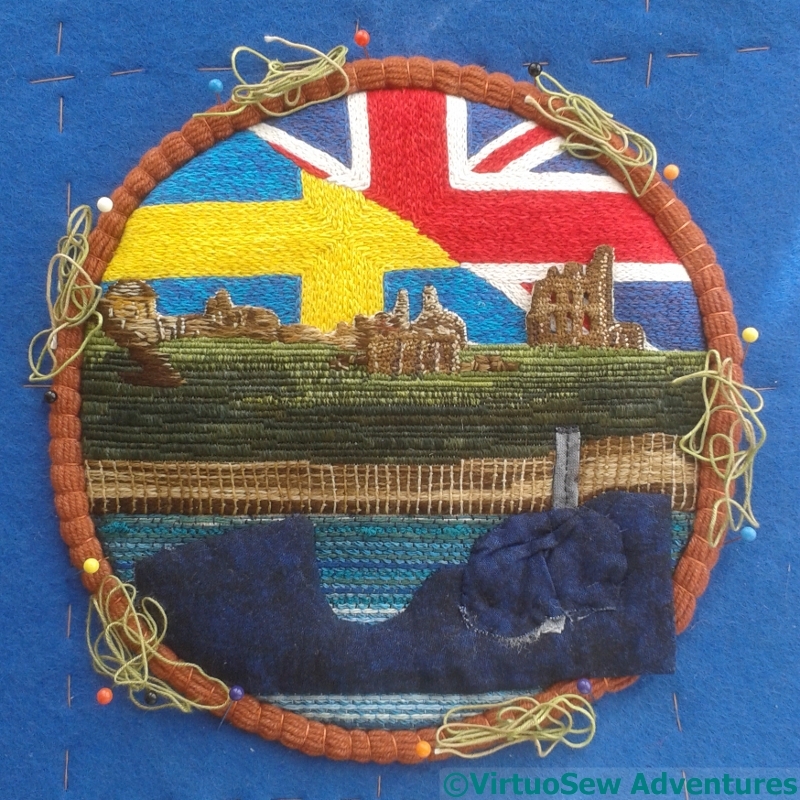 Since there will be a frame around the outside, the stitching doesn’t have to be invisible, but as a matter of pride it does have to be neat, even and the next thing to invisible…! The next stage was to add the headland. This didn’t happen all at once, because the first thing to do was to remove the sky. 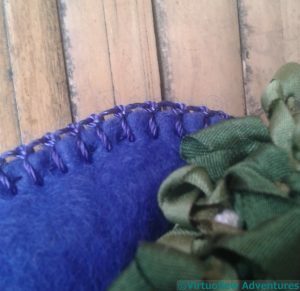 Since there are a variety of edge treatments here, some of the fabric was folded back, and some of it was simply trimmed very closely. It took two days of stitching time, and it drove me completely mad with frustration! However, one element which worked exactly as I hoped that it would was the ruined priory’s windows. 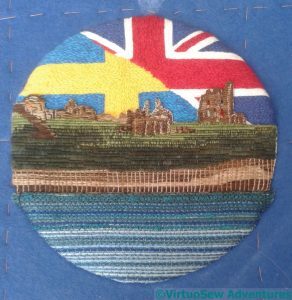 This is version two of the headland, and the ruin hasn’t been wired. I just invented a way to keep the windows open as I was doing it. 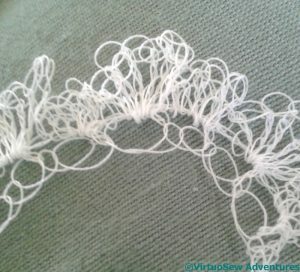 Removing the fabric behind this square inch (barely) of needlelace took nearly as long as the rest of the sky put together, but it was worth every minute, and every quiver of anxiety as I pulled threads away. Just as I hoped, you can see the flag sunrise through the windows!